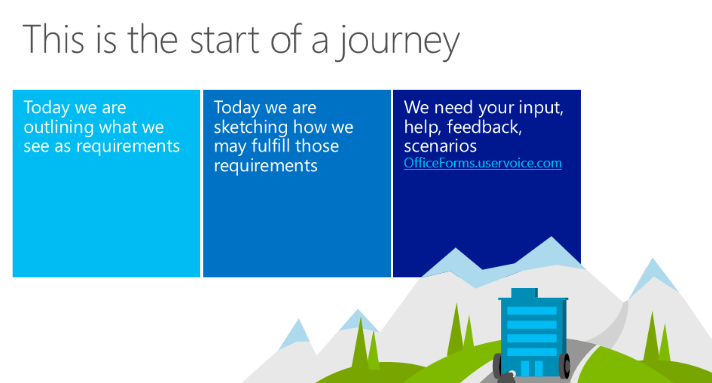 SharePoint Conference 2014 – It’s a journey! After taking the weekend to recover (only mentally of course!) from the fun and excitement of a successful SharePoint Conference, in beautiful Las Vegas, NV, I have decided to share some thoughts about what I saw and heard in regards to forms (Session #SPC348 in particular). This said, where does the power or business user stand? Frankly, not with InfoPath. In my professional experience people that work in most organizations don’t have the time (or constitution for that matter) to sit down and learn how to build these sorts of things in InfoPath. They have discreet sets of objectives, myriad as they may be, that they must satisfy to make sure they are accomplishing to grow their businesses. So what we found out at SharePoint Conference 2014 (SPC14) is that there will be no direct successor to InfoPath. Instead, Microsoft wants to focus on what each of their core products do well. Word, for example, will be utilized for fill-able forms, Access will help power a basic table view like forms functionality for lists a libraries (Forms on SharePoint Lists or FoSL, I really want to make a reference to dinosaurs here but I won’t do it… I won’t.) and then there will be Visual Studio options (LightSwitch). These options don’t sound friendly to power and business users. What should they do? Thankfully, Microsoft made it clear that partners are doing a bang up job in this space (an entire slide was dedicated to forms partners). They’re making forms accessible to regular, non-developer, users. While I am clearly biased by having a history with Nintex Workflow, I feel that the Nintex Forms product is a great way to move us forward when it comes to Forms. Why? Because I feel that forms are just that, forms. They exist as the user experience for data stored and manipulated inside of SharePoint. They need not be an object or application in and of themselves. They serve as the presentation layer to ones data and workflows. Integration with Workflow – Easily generate custom workflow forms. Native Office 365 – Yes, regardless of your SharePoint environment (on-prem or in the cloud), Nintex Forms has you covered. But hey, don’t take my word for it. Visit the link below to download a copy (or request a hosted trial) or spin up your favorite O365 / SharePoint Online tenant, visit the Microsoft Store and search for Nintex and download the app. In the end, is Nintex Forms a like for like replacement for InfoPath? No, it’s not. But, with simple to create SharePoint forms and a powerful mobile story, Nintex Forms is a compelling choice for achieving your forms goals.